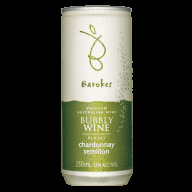 Bubbly Chardonnay Semillon, Bin 242A wonderful bubbly chardonnay wine. A classy chardonnay with lots of nuttiness, clean and dry with a delightful creamy aftertaste. 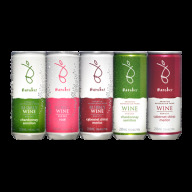 The nutty and fruity nose provides a wine of style.250ml cans of wine – Total 24 cans per caseOnline sales for Australia only, no international orders accepted. 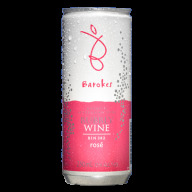 The Mixed case includes 5 of the Barokes premium range wines 250ml cans of each of the 5 Barokes Premium Range wines - Total 24 cansOnline sales for Australia only, no international orders accepted. Chardonnay Semillon, Bin 241Australian chardonnay semillon white wine from sunny climates combines a taste of rich, nutty chardonnay flavours from blends of mature wines with the delightful fruitiness of youthful semillon.250ml cans of wine – Total 24 cans per caseOnline sales for Australia only, no international orders accepted. A fine rosé with medium texture and flavour. Delivering fruity mouth sweetness and character. A nose of currants and flowers, and crimson-pink colour. 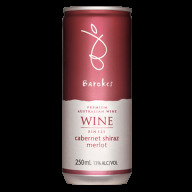 250ml cans of wine – Total 24 cans per caseOnline sales for Australia only, no international orders accepted. Premium Bubbly Moscato with flora aromas, a delicate cascade of bubbles and a fresh palate with lots of fruit and a good balance between sweetness and acidity. 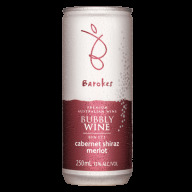 250ml cans of wine – Total 24 cans per case Online sales for Australia only, no international orders accepted.